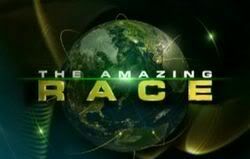 Re: Survivor Gabon 3 hour Finale: "no title yet"
-Two castaways are sent packing, leaving three to plead their case for the one million dollar prize and the title of sole survivor. -A shocking turn of events causes the castaways to scramble for new strategies in the moments before Tribal Council. -The fate of the final four rests in the hands of one castaway who reveals an outrageous decision at the most surprising Tribal Council yet. -The jury is faced with a million dollar decision after they question the last three castaways at the final Tribal Council. Find out what happens on the finale' episode of Survivor: Gabon, on CBS! Hopefully, we say goodbye to Kenny early on. Bob or Matty to win, its pretty obvious? go Bob!!! is all i have to say. "Say Goodbye to Gabon" — What started as a lopsided battle between the Fang and Kota tribes ends with a shocking turn of events between the remaining members of Nobag. Find out the fate of the final five leading into an outrageous decision at the most surprising Tribal Council yet, on SURVIVOR: GABON — EARTH'S LAST EDEN, Sunday, Dec. 14 (8:00-11:00 PM, ET/PT) on the CBS Television Network. 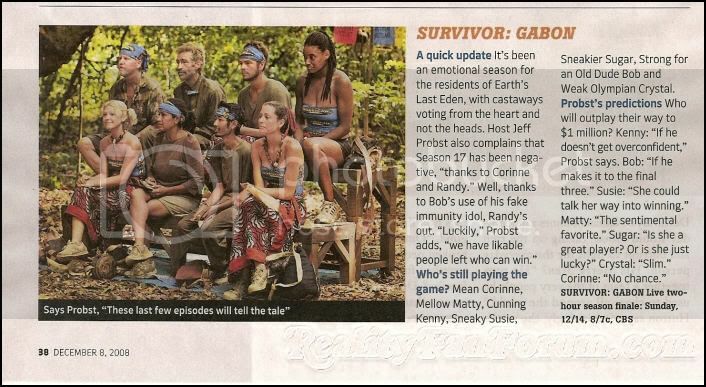 I bet it is Matty.. the whole I am alone thing, plus last time someone promised an immunity neckalace and did not give it up they did not win. I think Bob wins the first Immunity Challenge and they all turn on Kenny, sending him to the jury. Then either Bob loses the final Immunity Challenge or Bob wins it but decides to save someone else, leading to his being the final juror. Susie, Sugar and Matty are the Final Three. Susie doesn't get a single vote and it's between Sugar & Matty for the win. I think Matty will win, but it could be Sugar instead. Bob might not be able to run as fast as Matty or Kenny but best believe if theres a puzzle or maze involved, Bob has proven to be the master. He's good at figuring things out you know? -An interview with the winner of CBS' SURVIVOR: GABON. WINNER OF SURVIVOR - The 17th season of the hit CBS show “Survivor” airs its season finale on Sunday, and Monday, we will be speaking to the million dollar winner, live in our studio! I hope Bob wins. We Asians have voted Kenny out of the Union so he's no longer one of us. Matty needs to be thrown off a cliff and Sugar? She needs to be thrown to the wolves.